'The guide focuses on equipment for seating, continence, personal care and assisted moving and handling, it argues for wider application of the recommended approach, which should also be supported by manufacturers and information providers. Based on real-life experiences and written in an accessible style with illustrations and flow-charts.' -The Assistive Technology (AT) Forum News Bulletin 'This text provides a useful guide and resource on assistive devices. It could act as a reference point for a wide range of health professionals working with people with disabilities. It would be an excellent book as a resource for users.' - Physiotherapy Journal 'This publication offers an in-depth perspective on choosing equipment for people with disabilities. 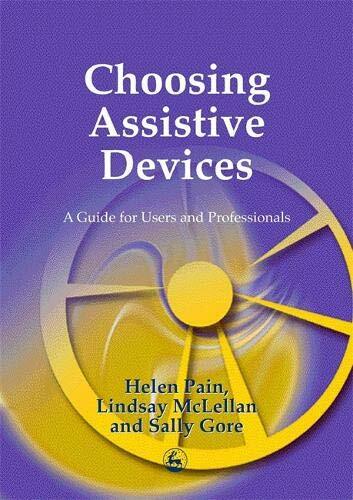 Its value to therapists will be high and it should prove a useful guide on the shelf of any department involved in 'choosing assistive devices'.' - British Journal of Occupational Therapy 'I found this book to be a welcome addition to my resource file, and I would advise my students and newly-qualified therapists to work through each topic as a basis for any decision-making. The process explained in the guide can be used as a justification for purchasing items of equipment (which may be expensive or outside the usual remit) helping with budget planning and decision making. I enjoyed reading this practical guide, and have started using it in my practice.' -Therapy Weekly 'The examples used throughout the book are very easy to understand and realistic. Each chapter has a clear introduction and makes good use of the key point section at then end. The text is backed up throughout with key references from other books and websites. It also advises the reader where else to go to get further information.very informative and would urge professionals, users and carers who use or work with assistive devices to have a copy on hand.' - Learning Disability Practice Bringing together information about the needs of people with disabilities and the equipment available for them, this accessible guide shows how the two can be brought together to provide an effective match of person and product. The authors have reviewed the available evidence that informs choice of the most appropriate assistive device to meet individual need. This much-needed guide sets out the many issues involved in choices about equipment, including availability, carers' requirements, possible funding and importantly the users' physical and intellectual capacity, opinions and lifestyle. Using an evidence-based approach they provide step-by-step guidance for therapists, family or professional carers and users in the selection of assistive devices. Drawing throughout on their own extensive professional experience, the authors present the information needed to make appropriate decisions about seating, toileting, handling and bathing devices, with illustrations and a useful list of resources. Their simple and practical guidelines will allow professionals and carers to improve quality of life for those with disabilities, and can help users of equipment themselves take a more proactive role in choosing assistive devices.